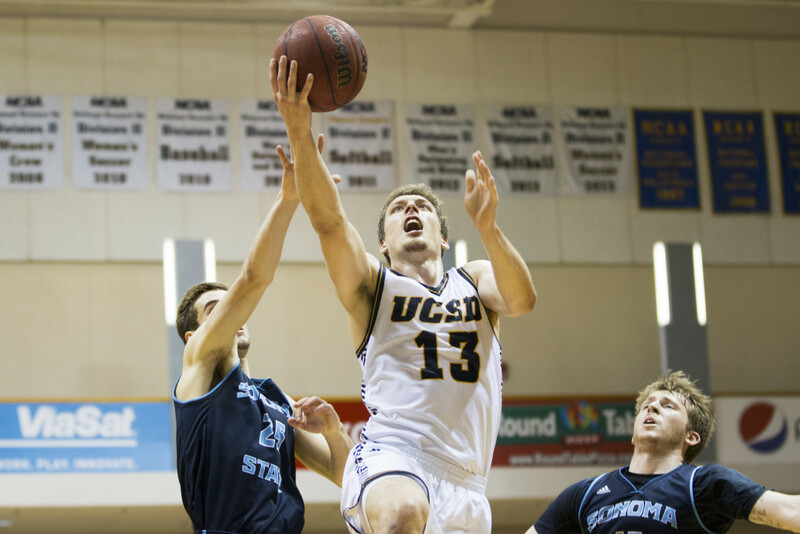 After dropping the season finale to Sonoma State on Saturday night, the UCSD men’s basketball team was given an opportunity for redemption in its California Collegiate Athletic Association quarterfinal match this past Tuesday night. Like their regular season finale, it was a tight affair for the majority of the game, but, with the help of a buzzer-beating miracle shot and overtime, the Tritons topped their conference rivals and earned a trip to the semifinal round in Stockton. Despite finishing the half a rough 2–11 from beyond the arc, the Tritons opened the game with a bang thanks to senior forward Drew Dyer’s defensive rebound and quick three-pointer. From then on, UCSD would lead for the entirety of the first half and partway into the second half. However, even with the lack of lead changes, the Seawolves would remain within striking distance for the entirety of the half, which culminated in a narrow 25–23 Triton lead. But the Tritons weren’t alone in their three-point shooting woes; the Seawolves shot a similarly poor 1–8 from downtown. The teams had to earn their points in other ways: Both the Tritons and the Seawolves bullied their way to paint, where the teams scored 12 points apiece. While their point totals were nearly identical, the Tritons were still able to out-rebound the Seawolves 20–13. Like in so many of their games this season, the Tritons were able to settle down and improve their scoring output during the second half. Despite giving up a large lead, the Tritons improved to 12–23 shooting overall, scoring 31 points in their duel with the Seawolves in a half that ended in the most exciting way possible: an unbelievable last-second shot. Down three with just over a second left in regulation, Dyer reminded everyone what it means to be clutch. Sophomore forward Kenny Fraser seamlessly relayed an inbound pass from senior forward Zach McMillan which Dyer converted to a drilling buzzer-beating three-pointer. However, the Seawolves weren’t intimidated as they quickly rushed out to five points within the first couple of minutes of overtime. But thanks to a quick couple of scores by junior guard Adam Klie, the Tritons were able to regain the lead and finally close out the Seawolves 71–66. Game hero Dyer finished the game with a team-high 17 points, six rebounds and four assists to go along with it; Klie and McMillan were close behind with 14 and 13 points respectively. McMillan also led the team with seven boards, while Klie tied Dyer for a team-high four assists. “We’re super excited to play against Pomona on Friday, and we’re excited to get there and get a shot at playing them,” McMillan said. With the win, UCSD advances to the CCAA semifinals to face off against third-seeded Cal Poly Pomona in Stockton on March 4.